If you've been following my blog for a while, you know that I'm a Disney queen - my family visits Walt Disney World frequently and I'm obsessed with all things Disney. 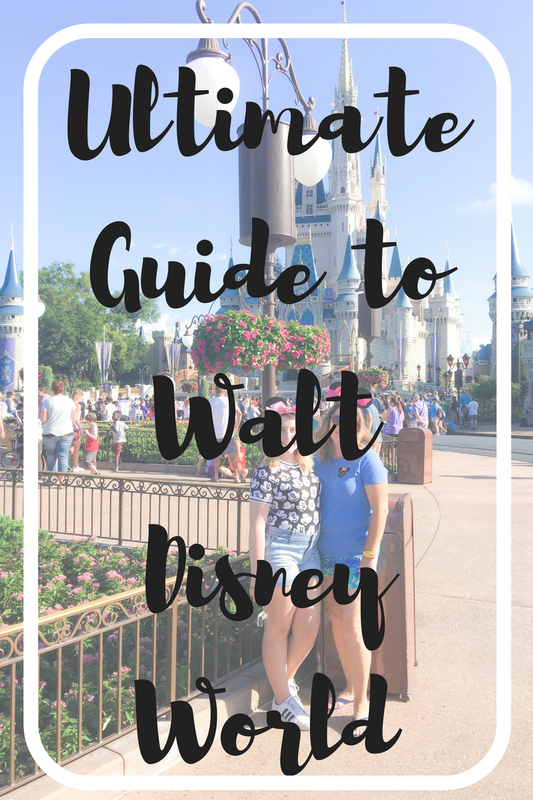 Today is kind of a big deal because I'm sharing my ultimate guide to WDW, letting you in on our tips + tricks, my favorite spots, and must-dos on a trip to Walt Disney World. I recommend park-hopping for dinner or waiting to eat when you get back to your hotel because Animal Kingdom doesn't have any restaurants that I absolutely love. Only one row of tables is directly beside the aquarium, we got lucky but you might want to make a request when you get your reservation. Snack: get a cronut from the stand between Canada and the pathway between the world showcase and future world. We always stay in value resorts because we don't spend any time in the hotel, it's basically just for sleeping and taking showers. There are buses that take you to all the parks and Downtown Disney. We've stayed in Allstar Music, Movies, and Sports but Pop Century is our favorite. Art of Animation is cool but the rooms for a family of four are a long walk from the bus stop. We like to eat quick service meals in Pop Century sometimes, either for a late night dinner after leaving Animal Kingdom or for breakfast on our last day. They have a dining plan deal that lets you get a full pizza plus two drinks for two quick service credits so you could have a meal for four people this way and save two of your quick service credits for later. Dining plan: Get a dining plan for sure - table service meals for a family of four are usually $200+ and quick service meals for a family of four can be around $75. You also get two snacks a day per person (as of 2018) so those can be anywhere from $4 to $12. A dining plan also gives you refillable mugs for your resort. Well worth the money. Plus, new in 2018, you can get alcoholic beverages (21+) and speciality beverages with your meals. Using snack credits on the dining plan: I always get a venti Starbucks Frappuccino (mocha to be exact) because I feel like it's a great use of a snack credit if I haven't seen anything else that I really wanted. You can also use a snack credit on a Dole Whip, the cronut I mentioned earlier, or any snack with the dining plan symbol next to it on the menu. The best snacks for your value are the ones that are at least $5 on the menu including Mickey pretzels, ice cream sundaes, and speciality cupcakes. Be mindful of using your snacks throughout the trip so you aren't left with 11 snacks on the last day (like we always are). Park hopper tickets: If it's your first time going to Disney, don't get park hopper tickets because you really need a full day for each park to enjoy and experience everything. We got park hopper tickets because we were doing two days at the parks before our cruise and it was a great way to visit all four parks. We definitely skipped a lot of things in each park, but it was fun to focus on our favorite things + be able to park-hop for our meals and different shows we wanted to see. Mickey's Not So Scary Halloween Party: So fun, definitely worth it to experience this ticketed event at least once. Wear a costume, preferably a Disney-related one. You can meet Snow White with all seven dwarves, Jack + Sally, and Pooh + friends all dressed up in costumes. The Hocus Pocus Villain Spell-tacular is amazing and so much fun if you love Hocus Pocus. Be sure to visit all the candy spots on the map. You can usually enter the park at 4 even though the event starts at 7. Very Merry Christmas Party: So festive, definitely worth it to experience this ticketed event at least once. Go to every cookie spot for a different kind of Christmas cookie and drink. The sugar cookies are so good. Don't miss the stage show with all of your favorite characters singing Christmas songs. Be sure to take a picture with Santa Goofy. You can usually enter the park at 4 even though the event starts at 7.